Hey Guys!! In case you haven't noticed yet, I have moved over to my new website World of JenCraft. Please join me over at my new home!! Would love for you to stop in for a visit. Stay a while if you wish. The door is always open!! Hey Guys!! I have a SUPER EXCITING announcement to make!! I am moving blogs!! You will now be able to find me over at worldofjencraft.com!!! I have been working on this for a few months and wanted SO badly to tell you all what I've been up to, behind the scenes. 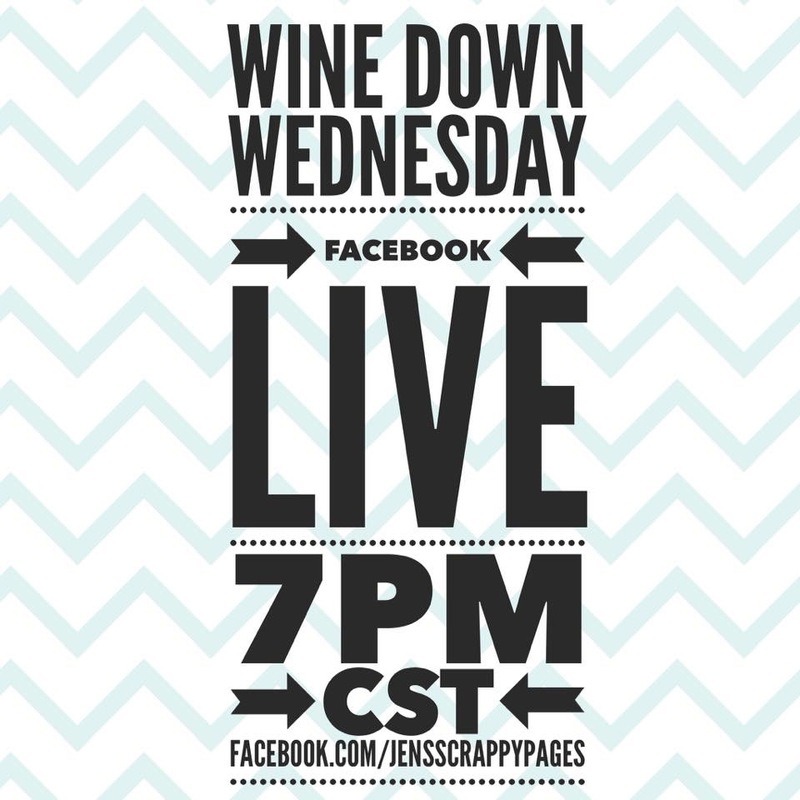 Make sure to head over there to check out my new digs AND to get ready for some BLOG CANDY starting tomorrow!! YAY!! 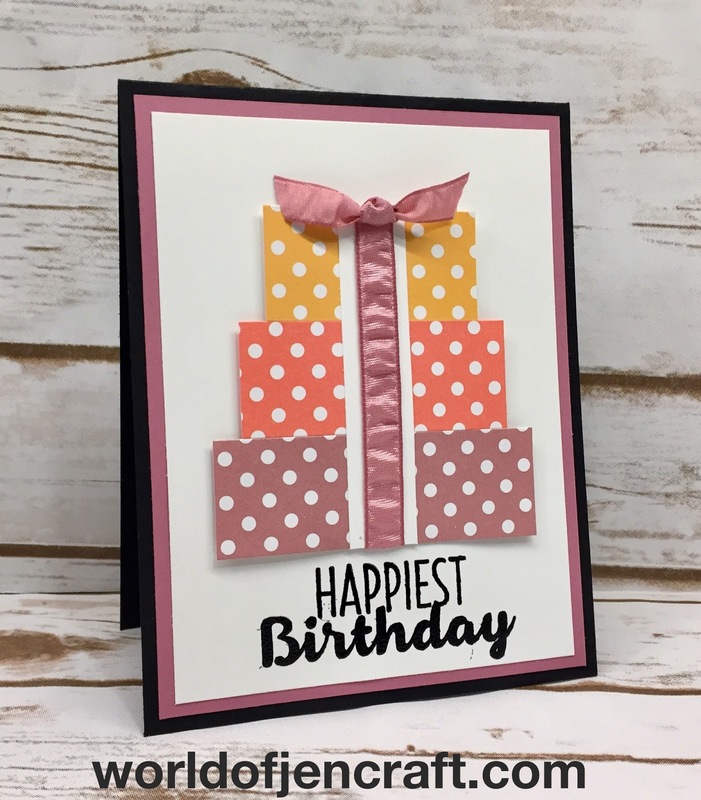 Today's card uses the retiring Sweet Sugarplum Ruched Ribbon along with the retiring 2016-2018 Designer Series Paper Stack. They are still available, but only for a few more hours!!! SO if you think you can't live without them, make sure to check it out TONIGHT!! 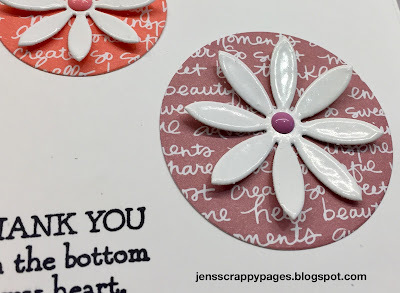 This card is TOTALLY Pinterest inspired!! I've been eyeing it for quite some time now and finally decided to break down and make one. I just LOVE the way it turned out using the polka dot papers!! It is such a HAPPY card, isn't it?? Make sure to "SUBSCRIBE" to my YouTube channel to receive notifications when I post new videos as I am adding 4-5 new videos each week!! If you don't have a YouTube account, but would like to subscribe to my channel, all you need to do is create a FREE YouTube account, go to my channel World of JenCraft click subscribe. Once you subscribe, you will be sent out notifications as soon as I post a new video!! In addition to the video tutorial I made, I also have printable/downloadable dimensions below the Stampin' Up! Supplies Used. Just click on the "Supply List" to download and print. 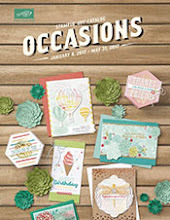 Don't forget, if you place an order that is less than $150, to use May’s Hostess Code 2MZMMYGW on my Stampin' Up! website. I send out thank you gifts at the end of each month to those who order from me!! If your order is over $150, please contact me directly so you can also earn the Hostess Credit for the order. Stay tuned for a customer loyalty program coming in the next few weeks! I have LOTS of new and fun stuff coming up that you are going to LOVE!! I thought I would keep it simple for today's project. 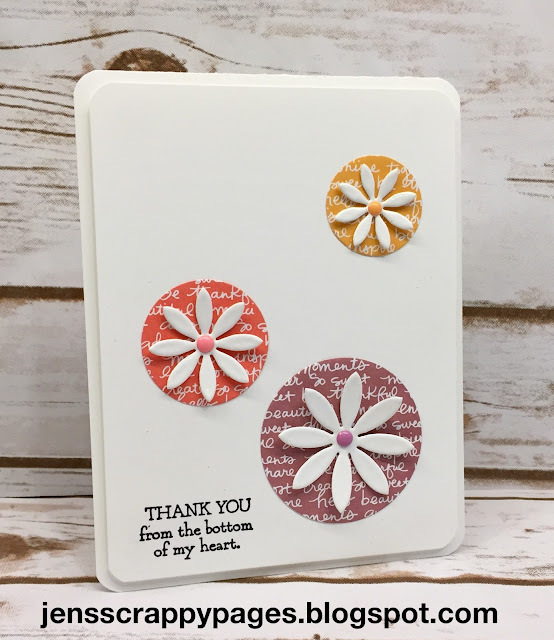 I double embossed the flowers using Whisper White CS and White Stamping' Emboss powder and LOVE the glossy look it gives them. It almost makes them look like enamel shapes. 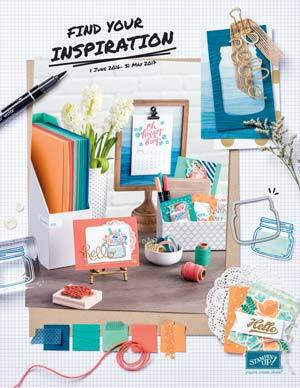 I used the retiring Succulent Framelits Dies, 2016-2018 In Color Enamel Shapes and 2016-2018 In Color Designer Series Paper Stack. The sentiment is from the Bella & Friends stamp set and the circles were cut out using the Layering Circles Framelits Dies. Don't forget, if you want to get your hands on the retiring products before they are gone forever, you need to do so by tomorrow night (May 31st). Make sure to "SUBSCRIBE" to my YouTube channel to receive notifications when I post new videos as I am adding 4-5 new videos each week!! 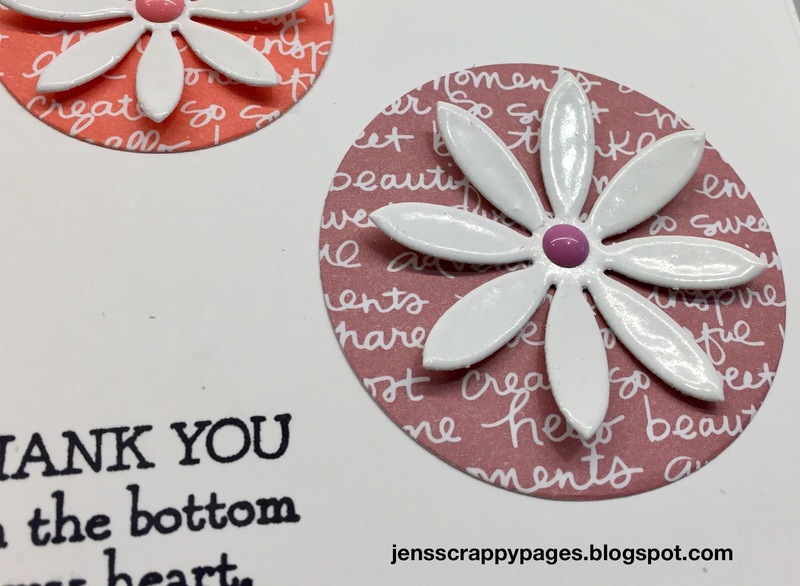 If you don't have a YouTube account, but would like to subscribe to my channel, all you need to do is create a FREE YouTube account, go to my channel Jen's Scrappy Pages click subscribe. Once you subscribe, you will be sent out notifications as soon as I post a new video! !